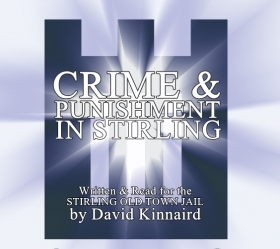 Twelve chapters of an audio history of Crime & Punishment in Stirling, produced for Destination Stirling's re-opening of the Old Town Jail visitor attraction in the summer of 2015 - are now available online. Written and read by David Kinnaird, the Stirling GhostWalk's 'Happy Hangman' (and the Jail's Chief Warden! ), it features many characters and stories which have been featured in the GhostWalks over the past 26 years...sometimes taking on a life of their own (as stories tend to do) far removed from their historical roots! Recorded at the Stirling Tolbooth, and remixed by Barry Frame of The Audio Clinic.